British Rail ran a staff bus between Sheffield Midland Station and Tinsley Marshalling Yard and at various times used this ex Mansfield District bus (fleet number 15), similar KRR 264 and KRB 88 which was an ex Midland General Leyland PS1 with a similar body. All ran in the colours of their previous owners. Later the work was contracted to Chesterfield Corporation who used one of their fleet of AEC Reliances to cover the duties. One of Sheffield’s 1957 Regent V/Weymann is behind, laying over at the terminus of service 60 to Crimicar Lane. This service had been extended from its former Leopold Street terminus in the City Centre to provide a useful link to the Midland Station. In the background one of the 1960 Alexander bodied Regent V is about to turn left into Pond Street Bus Station. Fascinating. Was a regular user of the 60 between Crimicar Lane and Midland Station – especially on the said Regent Vs. Was never aware of – and therefore never saw – the British Rail staff buses of any description. PS1 would have been 1946 onward but Regal III would have been 1947 onward. Other than that, I’m no help at all with the date. Not a terribly helpful comment, but I believe C T Humpidge was responsible for the blacking out of the cross pieces on the destination indicators as seen on the AEC Regent V and he took up post following R C Moore’s retirement in May 1961. Yet another fascinating Sheffield picture. In tram days, there had been additional cars on the Walkley section of the main cross-city route to Intake running between Walkley and the Midland Station, quaintly showing ‘LMS STATION’ on their blinds. When the buses took over from the trams on 8th April, 1956, the new 95 bus service was extended at the Walkley end from the old tram terminus along to Tinker Lane, and additional buses were put on between Elm Tree at the Intake end and Walkley (South Road) where the trams had terminated, but the connection to the Midland Station was severed. To reinstate that link between the railway station and the city centre, and no doubt to the delight of Fulwood passengers who up until this time had managed to get only as far into the city centre as Leopold Street, alternate journeys on the route 60 Fulwood were extended from Barker’s Pool down High Street and Commercial Street to the Midland Station. Imagine getting off your train to be greeted by just such a sight as this one, of a splendidly turned out AEC Regent V waiting on the station forecourt. The heyday of the bus, indeed. Ah what beautiful vehicles! There were 25 PS1’s new to Midland General in 1948 and 24 Regal III’s new to Mansfield District in 1949. The bodies were similar but the PS1’s were bodied by Saunders, withdrawal of these started in 1962 and was completed in 1964, Two went to British Rail, KRB 87/88 in 5/64 and 4/63 respectively. 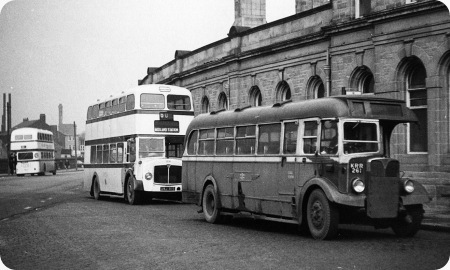 About a dozen of the Regals were transferred to Midland General in 1958 and whilst MDT began to withdraw their remaining ones in 1962, MGO kept their acquisitions until 1967, just short of 20 years service. They usually worked out of Alfreton garage on MGO’s ‘rural’ services E2,E3,E4 and E5 between Alfreton and Matlock, routes with some very steep hills, but their 9.6 litre engines could out-perform the later LS’s and MW’s any day! I remember being taken to Matlock on summer Sundays and I loved to travel on these, which were always kept in beautiful condition. On arrival at Matlock Bus Station, they kept company with Silver Service’s wonderful vehicles and North Western’s Bristol K’s. Matlock was a great place to visit then! Fortunately, one of the Regals, KRR 255 is preserved and I believe it usually resides at the Midland Railway Centre, Butterley, Derbyshire. The KRR Regal IIIs were new in 1949. KRR 255 is preserved and active. After service with British Rail KRR 261 went to Sykes a dealer at Worsborough Dale South Yorkshire. Does anybody know if this dealer is still trading? Am I right that Paul Sykes of Sykes is the same Paul Sykes who developed the giant Meadowhall mall in Sheffield & other ventures, one of the richest men in England? He probably doesn’t need to strip buses much now, but is the company or yard still going? oh no! Please gentlemen, surely it could only have been British RailWAYS ? Unfortunately that error seems to be perpetuated by most of the present day railway and model railway press. Despite that pedantic comment on my part, I have to say that I find this to be a marvellous site which I visit regularly. JOJ184, I’m afraid you are making the same error as those you are complaining about. There is nothing pedantic about accuracy and you are being accurate. Far too many people, particularly those working for various media, who claim great education, research and gravitas, daily project errors onto the airwaves, into print and on line. Given their standing and the widespread unthinking acceptance by the public of what they read and hear, especially from rolling news and internet sites such as Wikipedia, historians and researchers of future generations are going to have their work cut out to reach the truth. I’m not sure that anyone is being accurate actually. 1949 is the year the bus was new. The date it was photographed with BR is as yet unknown. It would be helpful if someone could post the date on which BR changed its name, then we might have a firmer basis for saying which name should be used. Phil, whilst wholeheartedly agreeing with your comments above I think JOJ184 has misinterpreted the heading caption to the photo. While it is somewhat misleadingly put as British Rail 1949, the year is actually referring to the AEC Regal III/Weymann build date. If you look closely at the side of the bus it is sporting the double arrow logo of British Rail and would have been taken sometime after 1965 hence on this occasion British Rail is the correct terminology. Strange how the board was still known as "The British Railways Board" long after the name British Rail came into use. If I recall the British Railways rebranding took place around 1965 and included the change of name, the both ways logo and a typeface- Rail Alphabet. This justified a memorable edition of Design Magazine. It was a major step forward- clear and attractive. Apart from London Transport and its successors I’m not sure if any other combination of transport providers has ever done anything like this: logos have been generally messy, undistinguished or unnoticed and liveries- shall we say- lacking in design coherence and simplicity. Some, like SYPTE’s red and yellow or Lincolnshire RC / YTC’s purple and yellow were just awful. For the record, JOJ184, British Railways changed its trading name to British Rail in 1965. So none of this thread would include WAYS!! Wasn’t the Sheffield Midland-Tinsley staff shuttle worked subsequently by SUT (using East Midland buses on summer Saturdays, when all SUT’s coaches would be in demand), and then by Booth & Fisher? I imagine the need for the contract came to an end when BR realised just what a white elephant Tinsley marshalling yard was. And I’m sorry to be a pedant here: but, Phil and JOJ184, the British Rail reference is correct as the picture must date from after the British Rail corporate launch in 1965 . . . as the bus is clearly sporting the BR double arrows. I’ve answered my own question. Wikipedia says that British Railways traded as British Rail from 1965. My copy of BBF5 is dated April 1965 and shows KRR 261 still with Mansfield District. Therefore the photograph must have been taken in 1965 or later, so that "British Rail" is probably correct. The point about the discrepancy between the date of the bus being built and the date of the photo is well made, as is the fact that the vehicle bears the British Rail logo, dating the picture to 1965 or later. With regard to the British Railways Board and the British Rail name, Peter Williamson has it spot on. British Rail was a trading and marketing name so, had this been a non nationalised company it would have been listed at Companies House as British Railways t/a British Rail. EFE produced a model of an AEC Regal in British Railways livery. It has the registration HKL 842 (Sheffield?) and the code 851-SOM on the sides. Does anyone have any information about this vehicle? HKL would be a Kent registration Ian. http://www.classicbuses.co.uk/mdreg.html and scroll down a bit there is a detailed history of the whole batch with a couple of photographs. It was new to Maidstone & District.